Two years ago we arranged an in-flight call with ESA astronaut Tim Peake. 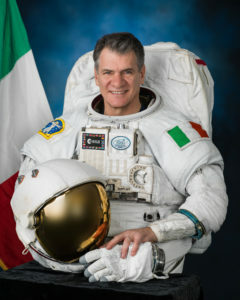 4th December this year, ESA astronaut Paolo Nespoli will in similar fashion be calling from space. As for two years ago, we are partnering with the European Space Agency and a local venue which will be acting as the official host for the In-flight call from the international space station. The venuw, Heureka is the Finnish Science Centre located just outside Helsinki, Finland. The In-flight call from Heureka in Finland will join in with the Czech Republic and Austria. Together, teachers from these three countries will talk with Italian astronaut Paolo Nespoli from ESA. The teachers will have prepared questions in advance, which will be sent to the international space station ahead of time, just in case. This event will mainly be for Finnish teachers, but as the In-flight call itself will be in English, others can tune in via web on the 4th December.